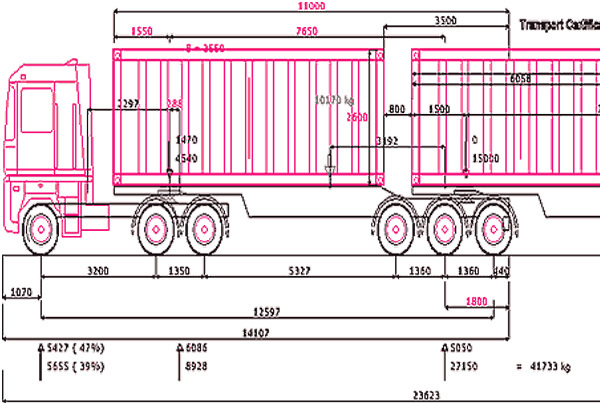 Truck body calculations in accordance with weight distribution, total vehicle length, load weight point etc. Truck data can be imported from a file, or data can be given by using the computer keyboard. The program covers data on the most popular models by a wide range of truck manufacturers. The truck and trailer may include various extra equipments: such as a crane, tipping gear, a rear lifter, a refrigerator and a lengthened cab. The program also contains data on some of the most common extra equipments, e.g. the weights and space requirements of certain tippers and crane types. The current version of the program identifies the following truck types: dual-axled, standard triple-axled (six-wheeler), middle axle type with steering front boggie, standard four-axled (eight-wheeler), eight-wheeler with triple boggie, and five-axled (ten-wheeler). The trailer may have two, three, four or five axles and a semi-trailer up to 4 axles. The program also identifies the single-axled (centre-axle) trailer, with a single axle, dual-axled or triple-axled boggie which may be part of a b-double or road train combination. 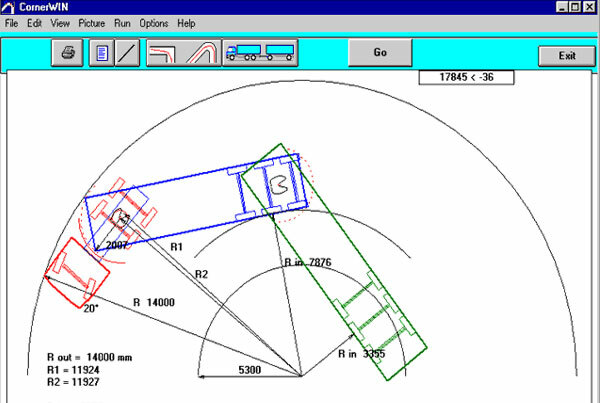 Calculation of a trailer for the selected truck. The program will automatically optimise the dimensions of the trailer. Should these dimensions be found inadequate, they can be modified to suit the requirements. Regulation check-up of a trailer and combination dimensions regarding the weight distribution, overhangs, corner distance and turning circle. The presentation of the truck cab is created as a real-life picture. The program provides a range of cab picture options, which can be supplemented later if necessary.